Help Orangutans and their Habitat. You can help save orangutans and their habitat. OFI is a 501(c)3 charity which relies almost entirely on donations from our generous supporters, individuals like you, who care about conservation, the fate of the planet, and the welfare of animals. Your support can help us make a big difference in the survival of individual orangutans at our Care Center, endangered wild orangutan populations, and the preservation of their forest habitats. To make a donation offline, please mail a check or money order to our Los Angeles office address below. I would like to cover the payment processing fee so 100% of my donation goes to OFI. Subscribe to our eNewsletter "Eyes on the Forest"
Donation Line accepts all vehicle donations for Orangutan Foundation International. They have towing agents in all areas of the United States ready to pickup your car donation ASAP. Non-Running, junk and salvage cars are also accepted. In addition to auto donations they accept donations of boats, trucks, RVs, motorcycles, jet skis, snowmobiles, planes and real estate. 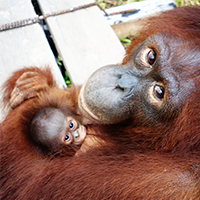 Because of your financial gifts, we are able to provide a home for 330 displaced orangutans and other wildlife.